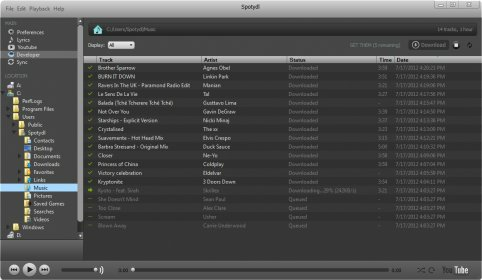 Software to download and listen your Spotify music. Application which allows you to edit video files. Video file converter for the Mac. Converts clips to a wide variety of video formats. Record sound data and edit audio files on your Mac computer. It is a video converter, player, editor for MPEG, QuickTime, iPod and more. It helps you convert videos to various media formats. Download videos from online resources and convert them for mobile playback. Convert your videos and audio files to dozens of formats. Convert MKV, MP4, AVI, MOV, WMV for iPhone iPad Android. Download online videos. This application lets you convert videos and tunes, rip and copy DVDs. Record your screen activity and easily edit the results. A powerful converter for both audio and video type formats. A utility for transferring data from iPod, iPad or iPhone to MacBook. Transfer content from your iPod to your Mac. Audio player, converter, and decoder for Mac. This program lets you convert videos to various media formats. A Mac application for ripping DVDs on your computer. This app helps you convert videos, images, and audio files on your Mac. Rip DVDs and convert DVD folders or ISO files to various formats. It works as a media converter, file burner, and handy media downloader. It's an app the helps you convert videos to various formats.